Literary tigermania shows no sign of abating. White Tiger, The Tiger’s Wife, Battle Hymn of the Tiger Mother… Like all of these, the latest addition to the string of Tiger-titled books, Tigers in Red Weather, has caused great excitement in the world of publishing, with hotly contested auctions on both sides of the Atlantic netting debut author Liza Klaussmann a £650,000 two book deal with Picador in the UK. The cryptic title is a quote from Disillusionment of Ten O’Clock (1915) by the American poet Wallace Stevens, mentioned in the book. Out in the real world, endless interpretations exist both of the poem as a whole and the phrase ‘chasing tigers in red weather’ in particular. Since it’s the one thing that’s spelled out, we can take disillusionment as a given; a sense that life could be more than it is runs through both pieces of writing. Now that the war was over, the scene outside the window, women waving handkerchiefs and red-eyed children, was less affecting. No one was going off to die, they were just going to an aunt’s house, or some boring work appointment. For her, though, it felt exciting; the world was new. She was going to see Hughes. Hughes. She whispered his name like a talisman. Hopes are high – the reality, as you might expect, is a different matter. Nick and Hughes have a daughter, Daisy, shortly after Helena has given birth to her son Ed and the quintet of characters telling the story is complete. 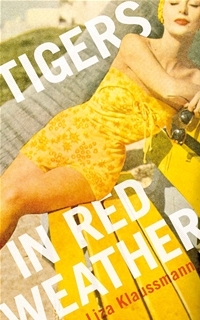 Tigers in Red Weather is being marketed as a novel which exudes glamour and I felt it delivered on the page something akin to what the TV series Mad Men brings to the screen: a stylised take on the America of a bygone era (with a special appeal for foreign readers), chipping away at the veneer of sophistication to uncover an intricate tissue of troubling family secrets. The story frequently returns to the events of summer 1959, when Daisy and Ed are 12 years old. Things are tense amongst the extended family as everyone converges on Tiger House for Nick’s ostentatious annual party, but a gruesome discovery made by the two children sends shockwaves through the island community and will have devastating consequences in the long term for everyone involved. Anyone not damaged before, is now. Tigers in Red Weather has some notable strengths. Liza Klaussmann’s compelling prose is as polished and elegant as the social environment she portrays, with a sharp edge that makes it thrilling to read. Her depictions of past decades and of place are stunningly evocative: the house, the cocktails (alcohol consumption is one of many excesses), the clothes… I could imagine being there in the torrid heat surrounded by those beautiful people, so decadently bored and bent on self-destruction. Her handling of suspense is very skilful, as is the way she revisits the same scene, right down to the very words spoken, with the effect of adding perspective rather than repetition. The truth has many faces and not all of them are pretty. Far from it. Overall I was seduced by this novel but the one area where it fell down for me was in character development. I really didn’t get the inconsistent and mostly unsympathetic Nick and I should have felt more than I did for the tragic figure of Helena and all her disappointments. They both felt more like a ‘type’ of woman rather than real people to me. Although the novel deals in universally relatable themes – love, betrayal, the search for elusive happiness – it didn’t really touch me on an emotional level. The complex structure may have got in the way here – as each character’s point of view is concentrated in one section but switches back and forth in time, there is a risk that the effort of keeping up with that will pull the reader out of the story. It also stands to reason that a novel with five narrative points of view will have to sacrifice some psychological depth, but it made up for it in other ways. The tension builds almost unbearably and it is a relief but also a shock to finally reach Ed’s version of events and discover how it all played out. He has to go last (you’ll see why if you read it) and is the only character to get a first person account. Unlike the others I found him completely fascinating and was very frustrated that his section is much shorter than the others – there was so much I wanted to know and understand about him, but the way the plot threads are pulled together is literally breathtaking (well, it made me gasp out loud on a train). If I hadn’t already read it, this would have been on my poolside TBR – just right for the Indian (tiger) summer we’re hoping for in the UK, or anywhere you happen to find yourself. Another terrific book set at an East Coast summer house is Maine by Courtney Sullivan, one of my Top 10 Summer Reads 2012 – and after four posts in the past two weeks, that’s it from me until early September now. I’m off to Provence to eat, drink, read and swim. Have a great holiday – and enjoy all the reading! Thanks Rowena, I need a break, it’s been a manic summer! See you in September.